A neighborhood of artists, poets, writers, intellectuals and musicians, St. Gilles is often seen as the Left Bank of Brussels. The influx of young French people living in and around the area certainly strengthens the image. Well, every Latin Quarter needs its café; the place where people meet, ideas are exchanged and friendships are built and here it is. 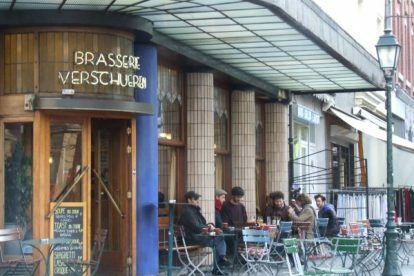 If Sartre were living in Brussels in 2014, Brasserie Verschueren would be his home from home. It exudes a timeless elegance, with a sense of history and a feeling of place. It is cool because it doesn’t try to be anything trendy. It’s just a fun place to come for an evening drink or a morning coffee and paper. On any night, the place is full with artists of some description and the creative and relaxed atmosphere is infectious. I like this place so much, I almost don’t want to share it. But, it’s a perfect example of a local Brussels bar and should be enjoyed.